In my last post, I looked at television and movies and discussed the amazing academic and social learning opportunities they present for visual learners. I also talked about the negative aspects of these and in particular, my belief that it's not violence that's the problem but language and stupidity - jackass; that last point is for you. In this post I want to look at other types of indoor recreation; computers, games, tablets, phones, music players and books. Computers represent an amazing "not-to-be-missed" opportunity for children with aspergers syndrome to pick up skills, follow their special interests, learn visually and even socialize. It's hardly surprising that the computing field has much more than its fair share of employees with aspergers. On the one hand, this stresses just how important it is to give your child access to them - and to the internet. Even gaming, which you may see as a "wasteful" activity, is really developing critical skills. (See: IBM: Serious Games for Smarter Skills: The Future of Learning). Not only are the right types of games developing strategic decision making, resource handling and problem-solving skills but they also give your child a critical common ground on which to engage other children in conversation both online - and more importantly, on the playground. A list of Apps for Autism for Android. The tablets may seem expensive but although the cheapests ipads in Australia are about $300, you can pick up an reasonably capable android pad for around $100, though the better ones are obviously more expensive - and then of course, there's ebay. If you can't afford a tablet, you'll find that many of today's mobile phones and media players offer the same functionality. 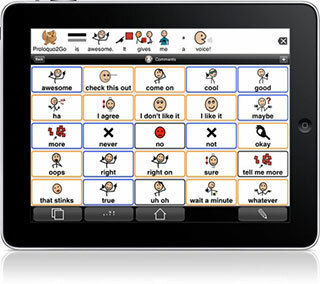 You'll also find that many government schemes exist for bringing iPads to children with Autism. Reading is arguably the most critical skill in today's modern society. Despite our iconography on signs, there are still massive amounts of reading to be done in our day to day lives. The librarians of the past frowned upon picture books, comics and even "formula fiction" but I'll let you in on a secret; "every single bit of reading helps regardless of the source material". It doesn't matter if your child refuses to move off a series - I fixated on Doctor Who books for years and when my teachers banned me from borrowing them, I saved up my money and bought all of them. In fact I still read them occasionally. Don't forget ebooks: Instead of carrying around a load of heavy books, you might want to consider an ebook for your child. You'll find them as low as about $60 AUS. There are many different types including the monochrome E-Ink variety such as the Kindle and Nook but personally I've found that the el-cheapo LCD ones are better because they provide bright colour which is essential for reading graphic novels and comics. Just make sure that your ebook reader can handle EPUB, PDF, JPG and TXT (at least). If your child isn't reading too well, don't focus on their reading level, get some reading which is close to their level and make sure that it's exciting. A ten year old isn't going to find "the cat in the hat" interesting anymore but did you know that DK do a line in "levelled" star wars books? Graphic Novels and comics make good reading too. Don't be afraid to try non-fiction and picture books too. There's nothing wrong with giving your child the Star Wars visual dictionary to read. Sure, he'll spend most of the time looking at the pictures but if it interests him enough, he'll read some of the text too. Like most things with children with Aspergers, Syndrome, the special interest is the key to reading. If your child leans the other way and is reading well beyond their years, the get them some adult books - just make sure that they're exciting. Unlike films, reading books with offensive language seems less likely to bring it out in conversation so it's ok to be less restrictive on topics. Personally, I started reading Stephen King aged 14 but back then, we didn't have a lot of material for teens like we do now. I realise that in this post, I've only concentrated on the good aspects of the media and that there are a lot of dangers to watch out for. I will address these in my next post. Great series. Very Valid points. Your comment about media creating "a critical common ground on which to engage other children in conversation both online - and more importantly, on the playground." is right on target. Though we have the final say on what he is able to watch/games he's allowed to watch/play. Media has given us a tool to discuss judgement as well. Our main concern with media... as with anything really... is the obsessive element of the Aspie. Once focused on a video game or series of shows, it's a real struggle to shift his attention to something or someone else.